Uploaded with print driver. Need additional languages? Install the print driver with the required language and add the Windows print driver to your Printix driver store. 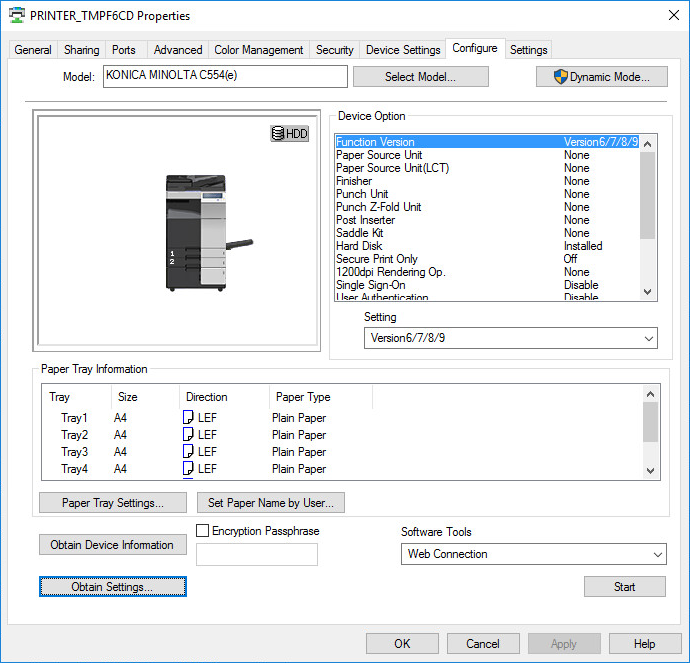 In the Printer properties dialog select the Configure tab. If Model is Baseline, then select Select Model. Select Auto or select the model. Select OK.
Device Option and the corresponding Setting. On the Configure tab click Obtain Settings…. Uncheck Auto and select OK.
Optionally open the Advanced tab and select the Printing Defaults… button to configure per-printer defaults. For example on the Quality tab you may want to change “Select Color” from “Auto Color” to “Gray Scale”, so users will print in black by default.